SeniorCenters.com are happy to offer the fantastic Listen LP-3CV-072 3-Channel FM Value Package. With so many available recently, it is great to have a brand you can trust. The Listen LP-3CV-072 3-Channel FM Value Package is certainly that and will be a perfect purchase. For this reduced price, the Listen LP-3CV-072 3-Channel FM Value Package is widely recommended and is always a popular choice with most people. Listen Technologies have included some great touches and this means great value. Start your assistive listening setup affordably with the LP-3CV-072 3-Channel RF Value Package. 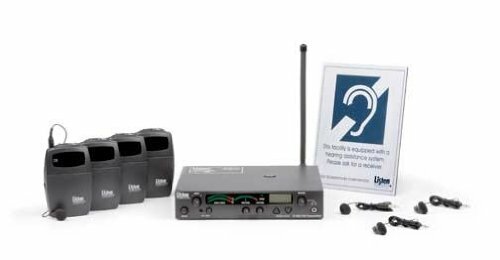 Meeting the basic assistive listening needs for classrooms, theaters, business meetings, training sessions, and more, the LP-3CV-072 includes our LT-803 stationary transmitter, four LR-200 3-channel receivers, a 90-degree helical antenna, ear buds, and a signage kit for full compliance in a basic system. Box Dimensions: 18" x 12" x 3"
System Includes: (1) LT-803-072 Stationary 3-Channel RF Transmitter (72 MHz) (1) LA-123 90° Helical Antenna (72 MHz) (4) LR-200-072 Standard 3-Channel RF Receiver (72 MHz) (4) LA-161 Single Ear Bud (1) LA-304 Assistive Listening Notification Signage Kit - Three channels - makes it simple to install, manage and use. - Reliable clear sound quality - 62 dB SNR. - Ensures public venues meet ADA requirements.